The peculiarity of John Singer Sargent’s upbringing, as an American born in Florence, allowed him to present a unique insight on both American and European culture during the 19th century. The current exhibition at the National Portrait Gallery demonstrates not only this insight but also the skill and position in society that Sargent used to depict it. He quickly rose to fame due to the controversial painting of Madame X, which was sadly not included in the exhibition, and despite the notoriety swiftly became the portraitist of choice for high society. This allowed him to paint the great and the good with relatively security as his reputation would no longer be destroyed with a brush stroke. Nevertheless he still took great pride in his work, once repainting an entire head when he heard the sitter was disappointed with the original result. Famous faces crowd the walls and each suggests a personality bubbling beneath the oil paint surface. I was fascinated to learn of Sargent’s friendship with Monet, who he painted with his wife over several years and kept one of these paintings in his studio throughout his life. When painting friends Sargent could be more experimental and this often shows through in the simplicity of his palette and the more unusual composition or setting of his subjects. This is especially evident in his paintings of Robert Louis Stevenson, which catch the writer as he strides across a room or sprawls in a chair. He is not treated with reverence as a writer but more interestingly is shown as a man who is married and part of a household. Apparently Stevenson’s wife thought when only the hand in one of the paintings was finished that it was already the best portrait that had been done of her husband. 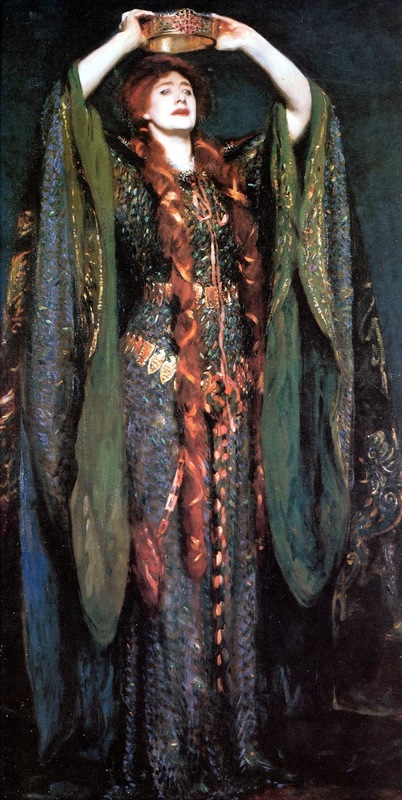 I particularly enjoyed the paintings of Ellen Terry as I felt they captured her formidable character better than any photographs I have seen of her before. They also portrayed her as an actor of great skill, terrifying all around her as Lady Macbeth, which was unusual for a time which often saw actresses as aberrations or amateurs. I almost felt that I could see Terry mid speech as she claws her way to Scottish power. The detail on this particular painting was very intricate, with gold twisted into her long hair and the feathers glistening on her dress so it was also interesting as a depiction of Victorian stagecraft as well as Terry’s personality. Unfortunately this exhibition is almost over and is only open until the 25th of May but I would still recommend it if you do get the chance to go! Luxury is a nebulous concept which is often assumed to be straight forward; piles of gold jewellery, high thread count sheets and caviar. However, ‘What is Luxury?’, the current exhibition at the V&A, demonstrates that this should not be taken for granted. The status of luxury items can change or even be lost across time and continents as resources grow scarce and priorities change. The exhibition is split into two sections to explore this idea, with half focusing on luxurious tastes of the past while the second half suggests what might become a luxury as our world continues to develop and change. This allowed parallels to be drawn between ideas of craftsmanship throughout the ages and the motivations behind each piece. Earlier examples, such as an intricate chasuble and a golden crown, were often inspired by religious devotion and therefore were designed with a purpose even though they appear frivolous. However, later examples focused more on how an object can be made luxurious and the effect that this has on its value. For example, Nora Folk creates necklaces from nylon which recreate the lightness of soapy bubbles but which can be worn outside of the bathroom while open backed watches reveal their mechanisms to show how precision can be beautiful. I was surprised to find that I particularly enjoyed the speculative section of the exhibition. It playfully questions how our concepts of luxury will continue to be formed by the scarcity of resources, ranging from oil and minerals to privacy and time. Aram Mooradian explores the effect of the gold mining industry on Australia’s natural and cultural heritage and suggests that in future gold will be used to store memories, such as in bullets, tooth fillings and lockets, just as it is currently used throughout electronic devices. This re-interpretation of a current luxurious substance fascinated me and I almost want to believe that it is real so that I can have my own gold memory player. It also offered a much more positive stance on the future than the DNA vending machine created by Gabriel Barcia-Colombo which commercialised access to healthcare. However, other ideas were not as believable and so appeared ridiculous in comparison, as elaborate stories were concocted around mining in space and the significance of stoppered glassware. This did not necessarily detract from the overall narrative but did serve as a reminder that an object’s status as a luxury is not automatic but depends on acceptance by society.